Last Updated: December 14, 2013 By Katie 26 Comments -- Paid Promotion. Disclosure policy here. I was doing some online Christmas shopping on Black Friday, and happened upon these aztec leggings from Kohl’s. Does that ever happen to you? You have every intention of buying for other people only, but then your little eyes just happen to drift on over to the Junior’s Leggings section (even though you’re really looking for a present for your dad, who is definitely neither a Junior nor a leggings wearer- ha!) and then you just happen to place a pair of leggings into your online cart and then oh? What’s this? That darn “checkout” button is clicked. It’s just so easy these days, I swear. No, but really, they were on a ridiculous sale, plus 20% off, plus free shipping, plus yadda yadda yadda. Those Black Friday sales. They got us. They got us good. But! On the plus side, I am completely done with my Christmas shopping! I met my goal this year (December 1st), and I am pretty darn proud of myself. High fives all around! Did you do any Black Friday shopping, online or in store? What’s the last thing you bought for yourself? p.s. I styled a cute holiday outfit over at Savvy Sassy Moms! It is definitely going to be my go-to holiday look this year. I’m in love. Yay for being done with your shopping already! Aww thanks Rachel!! I know, I’m so proud of myself! Absolutely love these leggings!! they remind me of some “navajo leggings” I found (which are on my Christmas List and circled so the boyfriend knows exactly what I want ;)). Dang!! I tried for December 1, but it just didn’t happen. I only have one more person to shop for and I am determined to get that done on Thursday!!! 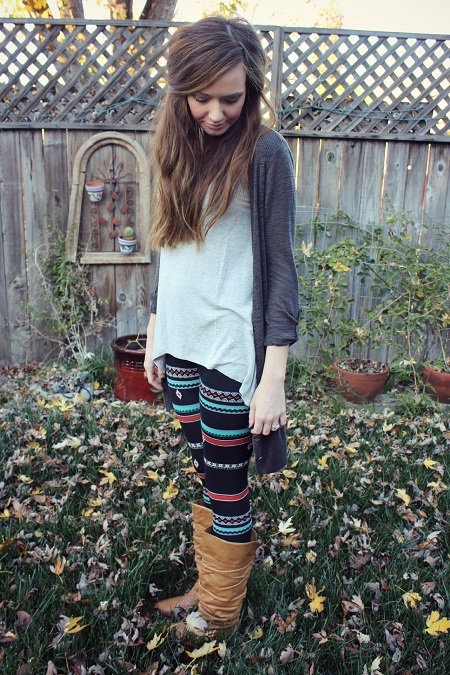 Those leggings are SO cute, love them! 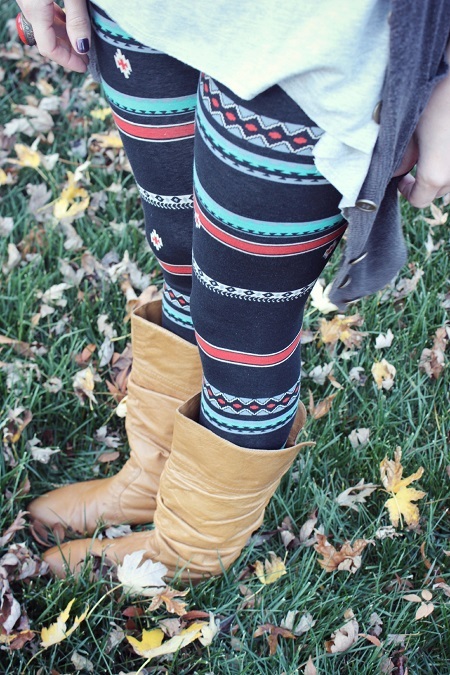 ooh i am on the hunt for some really cute aztec leggings! these are adorable! I didn’t do any blakc friday shopping- just more eating! Ha! I definitely did more eating too!! And it was the bestttt. Nothing beats leftover turkey sandwiches! Yay for hitting goal of being done shopping! I have two more people to buy for and then I am done too…I can’t wait to be done! Ha! Thanks. This is the first year I’ve ever done this, and I’m definitely not going to make it a goal EVERY year. But you know. It feels good to be done, not gonna lie! ;) You can totally do it! Yes! That’s happens to me all the time! I LOVE these leggings. I’ve wanted some for a while now. Aw thanks girly! :) And I’m so glad I’m not the only one! So funny. Aw thanks Ariel!! :) I’m happy about being done, that’s for sure! I love making things for people- so original and comes from the heart! I want to know what you end up doing! I always do the same thing- it’s so hard when you are shopping not to see something you like for yourself! Love the leggins- you styled them perfectly! Hahaha ohhh man you sound JUST like me. And then I come home with the three candles and get instant eye rolls from Zack ;) I get it, girl. I get it. You should definitely get some printed leggings!! They’re so fun! :) And you’d look great in them! YES, Old Navy has been having amazing sales lately! To be fair, our families are small and we are giving our parents albums of our wedding!! Ha! Hey, it’s a great time to shop, whether it’s for your or others!!! Ain’t no shame in that. And I looooved the first Christmas after the wedding, because literally all everyone wants/gets are wedding pictures!!! LOVE it!